If you like the restaurant style Paneer Tikka Masala, this is a very tasty homemade version,you'll forget the restaurant one! 1 tsp cumin seeds, 2-3 green cardamoms,1 strand of mace - ground into a fine powder. 1. Whisk the yogurt till smooth. add all the spices, herbs, gram flour, lemon juice, salt mentioned above. mix well. 2. Add the paneer cubes & capsicum, coat it well. Marinade for a minimum 1 hour in the refrigerator or overnight in the refrigerator. 3. Thread the paneer cubes on wooden or metal skewers, you can use a charcoal grill( which gives a flame flavour) or you can put it under the electric grill. 4. The paneer should be golden brown on all sides. 1. puree the tomatoes and keep aside. 2. whisk or beat the yogurt till smooth, keep aside. 3. heat oil in a pan. Add the ginger-garlic paste and sauté till there is no raw aroma. 4. add the tomato puree and continue to sauté for 3-4 mins. 5. add the turmeric powder, coriander powder, red chilli powder and garam masala powder. stir well. 6. cook well till you see oil leaving the masala paste from all sides and the whole mixture starts getting together. This should take 10-15 mins on low flame. 7. remove the pan from the fire, add yogurt and the leftover marination, stir well. 8. return the pan on fire and add water and salt. 9. stir well and simmer for 8-9 minutes on a low flame till the curry thickens a bit and you see fat or oil on the top. 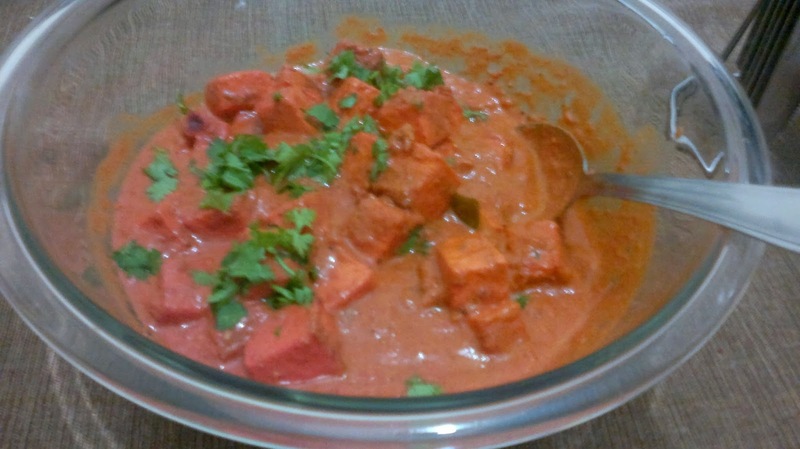 10. add the grilled paneer tikka cubes & bell pepper to the gravy and simmer for a minute or two on low flame. 11. then add some crushed kasuri methi and cream. stir. switch off the fire and the paneer tikka masala ready to be served. garnish with chopped coriander leaves and lightly spread cream in a thin line. 12. serve with naan, rotis or jeera rice. Asallamualeikum Sister.This is Mustafa Hatim Kassam`s friend who came to see him yesterday.Your blog is very nice but why don`t you take it further.Blogger has very limited scope.I suggest you get your own domain name and shift to wordpress for a better blog.Please see this site wwww.shoutmeloud.com and wwww.smartbloggers.com for more information. I myself have my blog the Friendship blog on mustafahatimpro.com .Do please have a look at it. Warmest Regards To Brother Kassam. Fantastic blog.Really thank you! I’d choose to make use of some with the content on my blog whether or not you don’t mind. I know that you explain it in very good manner. Magnificent post, very informative. I wonder why the other specialists of this sector do not notice this. You should continue your writing. I’m confident, you have a great readers‘ base already! This website basically beautiful points and things right. My curiosity to learn more and more on this blog. The next occasion I read a weblog, Lets hope so it doesnt disappoint me as much as this. Your posts are the flower of the flock.I decided to add your blog to my bookmarks so I can return to it at a later date. Wow! This one is the best foodie blog that I have found. This is my favorite recipe but you people given different method to cook with some additional spices. Because of this your dish sounds so yummy! Thanks for sharing this delicious post with us. On Nexter also you can check new dishes for new year. Salaam! Peace! Welcome to my blog! My name is Nasreen. I love to cook, bake, decorate and sew. I keep myself busy and thus end up keeping my four beautiful children busy too! The passion of cooking came to me when I was young, trial and error is what made me try harder to cook better. And my food taster tester is my dear hubby, who always compliments even when my food is a simple sandwich! Baking came to me from my only brother who loved cakes I baked, his appreciation and compliments till date make me work harder to do better. My sewing skills are passed to me by my dear mum who had no pattern making skills but would make any dress a Queen's dress! The best gift to give to friends and family is handmade and from home. I believe that success is achieved not by one person but with the people around you who make you successful. I thank The All Mighty for blessing me with this knowledge ,without whom nothing is possible.